Today is Bijoya Dashomi the last day of Durga Puja, when after a few days of vacation at her parents the Goddess goes back to Lord Shiva in Kailas Mountain. In every way it marks the end of the five day festivities all around Bengal. So while other parts of India celebrates Dussera with aplomb, a strange gloomy feeling surrounds Bengal and Bengali. After all the preparation, anticipation, pandal hopping, dressing up Dashomi makes us overwhelmed with mixed emotions.While our heart yearn for one more day of Puja frenzy, our mind assures us 'asche bachor abar habe' to wait for the puja next year. As I said Pujo for us Bengalis is synonymous with homecoming. It's the time when no matter where a Bengali lives they long to come back home in Bengal and enjoy the few days with their family. And Dashomi celebrates the end of that time with sweets and other treats. It's a day to seek blessings from your elders by touching their feet and start our life again with renewed energy. Yes, the five day festivities are over and its time to get back to routine, getting up early and do the daily commut with a smile on your face because somewhere in your heart you are assured to be back again soon. This year I had plans to post some festive recipes but then I could not. For some obvious reason the festivities could not make me happy yet I carried on for the sake of my little kids. We stayed home most of the times and bonded over some quality time. 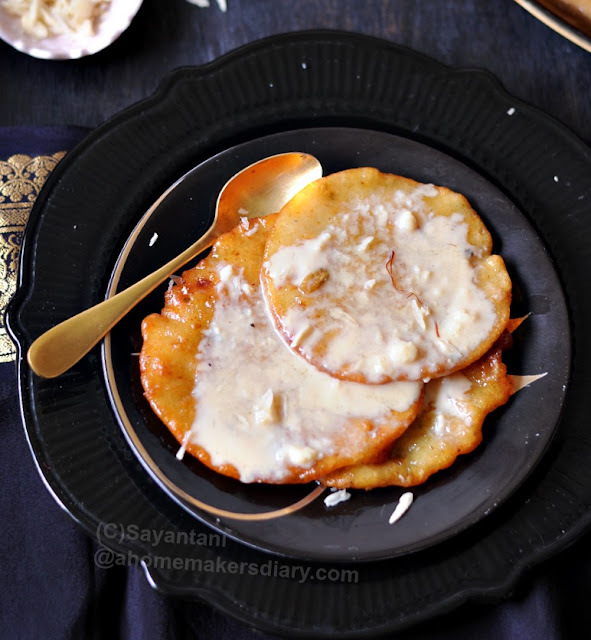 But today my little one requested for Malpua and Nimki like his Dida used to make...I knew I had to make it. So here it is my most seeked and loved Malpua recipe. Soak the Suji in milk with sugar. Keep aside. In the mean time start preparing the Kheer. Start boiling the milk in a flat pan for easy evaporation and thickening and simmer it on medium heat. On another pan mix the sugar and water for syrup with the saffron strands and start boiling. Mix and stir both with two separate spoons from time to time so that it does not burn at the bottom. 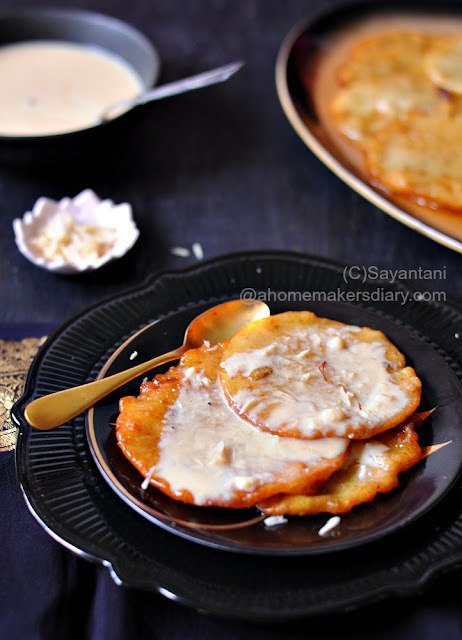 It will take close to 20 minutes for both of the syrup and kheer to thicken. Once the syrup is thick (think of Gulab jamun syrup) take it off the heat. 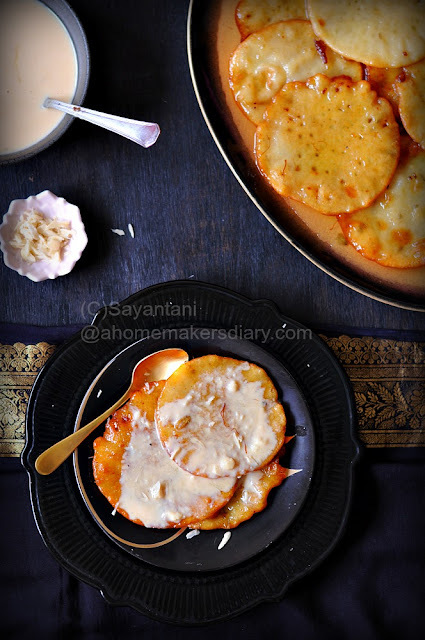 When the Milk is thick add the grated khoya and sugar and mix. Simmer for another 5 minutes or till it's thick like Rabdo or pancake batter. Grind the green cardamoms and add to the milk after taking it off from heat. To the soaked suji add the flour and using a whisk mix still you get a homogenous batter. The consistency wont be thick but not runny either. It should spread when big spoonfuls are dropped in hot oil. Now mix in the pounded fennel seeds, baking powder and grated khoya. Mix and keep aside. Heat oil for deep frying in a flat frying pan. For flavour you can add a tbsp of ghee. Take a 1/3 cup measure serving spoon and on low heat carefully place the batter in the center of the pan. Fry on both sides till golden brown (2-3 minutes all together). Using a tong drain the excess oil and dip it in warm syrup. Take out and keep in a shallow bowl. To serve spread a spoonful of kheer on top of each malpua and sprinkle some chopped pista or almond. Tastes good both warm or hot. So preferably you should micro them for a brief 10 seconds and before serving. Shubho Bijoya to you and your family. Stay blessed! Have never tried this dish - but would love to. Nice recipe.